Clearvewe01291 671515work01291 671515fax Bed & BreakfastIf you want to get off the beaten track this year but don't want to have to travel miles to get there, then why not come to one of the undiscovered gems of south east Wales. Just 30 minutes from the M4 and yet you could be in another world. Situated on the top of a hill overlooking the Vale of Usk, Clearvewe is part of a traditional barn courtyard in the most beautiful, unspoilt countryside. You will stay in self contained accommodation in the converted cart house, offering the privacy of your own lounge and garden, with secure facilities for vehicles and sports equipment. 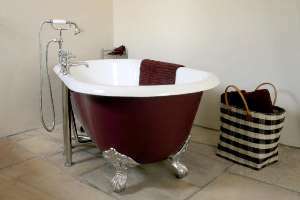 Each room is en-suite: two with roll top baths and one with a shower wet room. They are individually furnished with natural oak and mahogany furniture, beautiful cotton bed linens and the highest quality mattresses. All your food is locally sourced, with known provenance and we take great pride in baking our own bread for you to enjoy. If you want to get off the beaten track this year but don't want to have to travel miles to get there, then why not come to one of the undiscovered gems of south east Wales. Just 30 minutes from the M4 and yet you could be in another world. Please visit our web site www.clearvewe.com to see more of what we can offer and the range of things to do and places to explore while you're here. Please see web site for directions. Newport or Abergavenny train station. Bus to Llangwm or Usk.